Note that Gyrasoft Products are governed solely by the License agreements (the "EULA") under which they are sold or licensed. Always check the Gyrasoft Software EULA to make certain that neither You nor Your software application, infringe the intellectual property rights of Gyrasoft or others. All Information Gyrasoft collects from You are stored and maintained on secured servers. Gyrasoft does not lend, lease, sell, or market information it obtains from its customers or those who provide us personally identifiable information. Gyrasoft does not disclose purchase information or licensing information to third parties. Gyrasoft collects information such as Name, Email address, installation date, uninstall date and the actual Gyrasoft products you install when you register for free products or trial versions of our software from the Website and other Gyrasoft web properties. The information we collect is used for licensing, quality assurance and communication purposes only and allows us to inform registered users of upcoming product updates and new product releases. If You've registered with Gyrasoft and want to be removed from any mailing list, You can do so by writing to us at support@gyrasoft.com or by phone in the United States at (478) 988-4773. Alternatively, You can contact us and be removed from our Email list. By doing so, You will not be contacted by Gyrasoft at any time in the future. Gyrasoft collects information such as Public Name whenever You register and participate in our Support Center or Forum discussions. The information we collect may be used to display Your information to others when posting on Support Center or Forums. If You do not want any personally identifiable information to be made available to others – such as Your name – do not register for our Support Center or Forums. If You've registered for our Support Center or Forums and want to be removed from our user database, write to use at support@gyrasoft.com or call us in the United States at (478) 988-4773. Gyrasoft collects personally identifiable information whenever You purchase/license a Gyrasoft product. Information includes Name, Address, Phone Number, Email address, Payment Information, Product Purchases, Licenses Owned, Employee/Contact Details, etc. The information we collect allows Gyrasoft to communicate with You regarding upcoming product updates, new product releases, company news and other important business matters. To help prevent software piracy, Gyrasoft also collects information on the number of installations of a given product You've purchased via our product licensing mechanisms. At any time, You can contact us at at support@gyrasoft.com or call us in the United States at (478) 988-4773 and remove Your name from any mailing list. By doing so, You will not be contacted by Gyrasoft at any time in the future. When you optionally join the Customer Input Program, your computer or device automatically transmits information to Gyrasoft about the usage of Gyrasoft products and software development technologies. This information is used to address issues within Gyrasoft products and improve quality/usability. The Customer Input Program is strictly optional and you can opt in or opt out of the program at any time by executing the Gyrasoft installer and making the appropriate selection within the installation program. The Customer Input Program does not transmit personally identifiable information such as your name, address or phone number. The Customer Input Program only collects information related to Gyrasoft controls and libraries. This information includes usage of Gyrasoft controls at design time within Visual Studio and usage of Gyrasoft demos. No information is collected from applications/demos you create. All intellectual property rights associated with the Website and its Contents are the sole property of Gyrasoft, LLC. The Content is protected by US and International copyright laws. All Gyrasoft Service Marks so designated and all Gyrasoft Products referenced on the Website are either trademarks or registered trademarks of Gyrasoft, LLC. All custom graphics, icons, and other items that appear on the Website are trademarks, service marks or trade dress of Gyrasoft, LLC and may not be used in any manner without the express written consent of Gyrasoft. Gyrasoft has made every effort to supply third-party trademark information on the Website. All third party trademarks represented on this web site may be the property of their respective owners. Certain areas of the Website may contain other proprietary notices, conditions of use, and copyright information, the terms of which must be observed and followed. Gyrasoft does not wish to receive, act to procure, nor desire to solicit, confidential or proprietary materials and information from You through the Website. Any and all materials or information divulged during chats, online discussions, Support Center or Forum submissions, or made available to Gyrasoft in any manner will be deemed NOT to be confidential by Gyrasoft. You acknowledge that submissions to Gyrasoft will not be considered confidential or proprietary and that Gyrasoft will be under no obligation to keep such information confidential. You further acknowledge that Gyrasoft will have an unrestricted, irrevocable license to use, reproduce, display, perform, modify, transmit and distribute such materials or information, and You also agree Gyrasoft is free to use any ideas, concepts, know-how or techniques that You send to us for any purpose. This includes any submissions, changes, updates or corrections made via the Website Localization Service. The Website provides You the opportunity to provide and receive technical support assistance with third parties (the Gyrasoft End-User Community) via online forums, chats and the Support Center. Gyrasoft makes no representations or warranties regarding the validity or quality of the technical support assistance You obtain from third-parties on the Website. You agree that use of third-party technical support assistance is done so at Your own risk. The Website provides a Localization Service that is maintained and updated by third-parties (the Gyrasoft End-User Community). Gyrasoft makes no representations or warranties regarding the validity or quality of the Localization Service You obtain from third-parties on the Website. You agree that use of third-party Localization Services obtained via the Website is done so at Your own risk. The Website may contain links and references to non-Gyrasoft Websites and resources (“External Sites”). Links to External Sites are provided for informational purposes and in no way represent an endorsement or approval by Gyrasoft. Gyrasoft makes no representations or warranties regarding the validity or quality of any content, software, or service hosted on any External Site. You agree that use of External Sites is done so at Your own risk. Gyrasoft, at its sole discretion, may terminate YOUR access and use of all or any portion of the Website and its Content at any time, with or without cause. Upon such termination, You must immediately discontinue use of the Website. THE CONTENT PROVIDED ON THE WEBSITE AND ALL RELATED COMMUNICATIONS ARE PROVIDED ON AN "AS IS" BASIS AND ARE FOR INFORMATION PURPOSES ONLY. IN ADDITION, ALL WARRANTIES ARE HEREBY DISCLAIMED, INCLUDING THE IMPLIED WARRANTIES OF MERCHANTABILITY, FITNESS FOR A PARTICULAR PURPOSE, OR NON INFRINGEMENT. SOME JURISDICTIONS DO NOT ALLOW THE EXCLUSION OF IMPLIED WARRANTIES, SO THE ABOVE EXCLUSION MAY NOT APPLY TO YOU. The Content, including but not limited to localization tools, provided on the Website may contain technical inaccuracies or typographical errors. Content, including but not limited to pricing, subscription terms may be changed or updated without notice. Gyrasoft may also make improvements and/or changes in the products and/or the programs described in this information at any time without notice. To the extent permitted by applicable law, in no event shall Gyrasoft be liable for any special, incidental, indirect, or punitive and consequential damages (including, without limitation, damages for loss of business profits, business interruption, loss of business information, or any other pecuniary loss) arising out of the use of or inability to use the Website and associated Content, even if Gyrasoft has been advised of the possibility of such damages. You understand that the Content made available on the Website may produce inaccurate results. You assume full and sole responsibility for any use of the Website and its Content and bear the entire risk for failures or faults. You agree that regardless of the cause of failure or fault or the form of any claim, YOUR SOLE REMEDY AND GYRASOFT’S SOLE OBLIGATION SHALL BE GOVERNED BY THIS AGREEMENT AND IN NO EVENT SHALL GYRASOFT'S LIABILITY EXCEED THE PRICE PAID TO GYRASOFT FOR THE SERVICES RENDERED VIA THE WEBSITE. You agree to indemnify and hold harmless Gyrasoft, LLC, its contractors, and its licensors, and their respective directors, officers, employees and agents from and against any and all claims and expenses, including attorneys’ fees, arising out of Your use of the Website, including but not limited to Your violation of this Agreement. Gyrasoft expressly complies with all export restrictions imposed by the government of the United States of America. You must agree not to export or re-export applicable Content available within this Website to any country, person, entity or end user subject to United States export restrictions. Restricted countries currently include, but are not necessarily limited to Cuba, Iran, North Korea, Sudan, and Syria. You warrant and represent that neither the U.S. Bureau of Export Administration nor any other federal agency has suspended, revoked or denied Your export privileges. Should You have any questions concerning this EULA, or if You desire to contact GYRASOFT for any reason, please contact us directly in the United States at (478) 988-4773, or info@gyrasoft.com. Copyright © 2005 – 2014 Gyrasoft, LLC. All rights reserved. 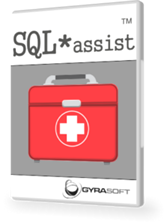 Gyrasoft, the Gyrasoft logo, SQL*Plus Assist, RMANassist, SQLsmith, SQLdiff, SQLSamurai, DropEdit are registered trademarks of Gyrasoft, LLC. Microsoft, Windows, Windows NT, Visual Studio, Visual Basic, Visual C++, Access, Outlook, Word, Excel, FoxPro, Visual InterDev are trademarks or registered trademarks of Microsoft Corporation. Apple, iPhone, and iPad are trademarks or registered trademarks of Apple Inc.
Google and Android are trademarks or registered trademarks of Google Inc.
Borland, Delphi, C++Builder, RAD Studio, Embarcadero are trademarks or registered trademarks of Embarcadero Technologies Inc.
You do not find an answer? Copyright © 2013 Boson. All Right Reserved.